The zamoto Kawarasaki Gonnosuke I held this name from 1648 to the 7th lunar month of 1690. Real son (or adopted son ?) of Kawarasaki Gonnosuke I. His first name was Kawarasaki Kozaemon. He took the name of Kawarasaki Gonnosuke II and became a zamoto in 1691, producing a Kabuki show in the district of Sakai-chô. Most likely, it was his only production and he quickly retired. He died the 4th day of the 8th lunar month of 1738 . Adopted son of Kawarasaki Gonnosuke II. His first name was Kawarasaki Chôjûrô I  from 1733. He took the name of Kawarasaki Gonnosuke III and started his career of zamoto in the 3rd lunar month of 1735, opening the Kawarasakiza, the hikae yagura of the Moritaza, which went bankrupt. His first program was the drama "Isaribune Reigen Irumagawa", starring the actors Sakata Hangorô I, Tsuruya Nanboku I, Yamashita Kametarô, Sengoku Hikosuke I, Hayakawa Shinkatsu and Sodesaki Miwano I. 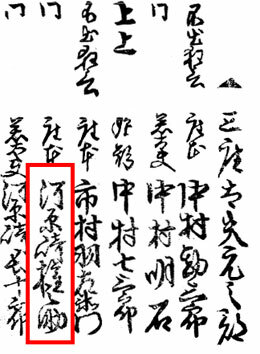 In the 11th lunar month of 1743, Gonnosuke did not have the money to hire stars for the top of the bill of his kaomise and quickly had to close his theater in Spring 1744. He went bankrupt and gave back the license to Morita Kan'ya V, who brought back the Moritaza to business in the 11th lunar month of 1744. He died the 24th day of the 1st lunar month of 1775 . Born in Edo the 7th of the 1st lunar month of 1735. He was the son of Kawarasaki Gonnosuke III, who gave him the name of Motojûrô. He received the name of Kawarasaki Gonjûrô  in 1742. He took the name of Kawarasaki Gonnosuke IV in 1790 and started to work as a zamoto. In Spring 1789, Morita Kan'ya VIII went bankrupt, Gonnosuke received the license for Kabuki performances in the 2nd lunar month of 1790 and produced his first kaomise, entitled "Daidan Kanjinchô", in the 11th lunar month of 1790, starring the actors Ichikawa Danjûrô V, Bandô Mitsugorô II, Osagawa Tsuneyo II and Nakamura Sukegorô II. He died in Edo the 4th day of the 1st lunar month of 1796 . Dates of birth and death unknown. Son of Kawarasaki Gonnosuke IV, who gave him the name of Kawarasaki Chôjûrô II. He suddenly became zamoto in the 1st lunar month of 1796, when his father retired and died. He produced his first kaomise, entitled "Itsukushima Yuki no Kaomise", starring Matsumoto Kôshirô IV, Ichikawa Komazô III, Onoe Matsusuke I and Osagawa Tsuneyo II. He had to give back his license to Morita Kan'ya VIII in Fall 1797. Gonnosuke was back in business in the 11th lunar month of 1800, producing at the Kawarasakiza the kaomise drama "Modoribashi Tsuna Kaomise", which starred Onoe Matsusuke I, Bandô Hikosaburô III, Arashi Hinasuke II and Iwai Kumesaburô I. He managed his theater up to the 3rd lunar month of 1808 and gave back the license to Morita Kan'ya IX, who went bankrupt in Spring 1815. Gonnosuke reopened his theater in the 5th lunar month of 1815 and managed it for 2 seasons, up to the 10th lunar month of 1817. He got back his license in 1819 and had to give it up in 1822. Gonnosuke did not have to wait for a long time before restarting his business because the Moritaza only lasted one season. The Kawarasakiza reopened in the 10th lunar month of 1823 and Gonnosuke managed it up to Spring 1830. He fell ill and gave both his name and the theater to his adopted son Kawarasaki Gonzaburô I. He died in 1834. Born in Edo in 1814 in the district of Honjo Matsukura-chô. His mother remarried with Kawarasaki Gonnosuke V. He was adopted by the Kawarasaki clan and took the name of Kawarasaki Gonzaburô I. He took the name of Kawarasaki Gonnosuke VI and was officially assigned the management of the Kawarasakiza in the 4th lunar month of 1830 but, because he was too young, others people supervised the theater from behind the scenes. Performances at the Kawarasakiza stopped in the 5th lunar month of 1833 and the new Gonnosuke gave back the license to Morita Kan'ya X, who brought back the Moritaza to business. The Moritaza went bankrupt in Fall 1837 and Gonnosuke reopened his theater in the 11th lunar month of 1837, with the drama "Sekai ha Taira Ume no Kaomise", which starred Onoe Kikugorô III, Ichikawa Ebizô V, Ichikawa Danzô V, Bandô Hikosaburô IV, Ôtani Tomoemon IV and Onoe Kikujirô II. 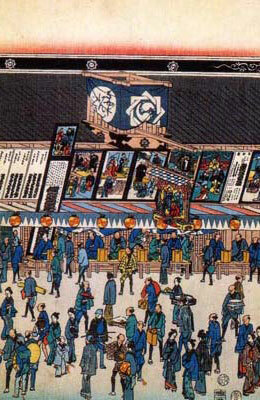 In the 12th lunar month of 1841, the Kawarasakiza was ordered by the shogunal authorities to move to the remote district of Asakusa Saruwaka-chô. The old theater was closed in the 12th lunar month of 1842 and the new one opened in the 5th lunar month of 1843, with the performances of the classics "Kanadehon Chûshingura" and "Sugawara Denju Tenarai Kagami". Gonnosuke managed his theater up to its destruction during the Ansei earthquake (Ansei Daijishin) the 2nd of the 10th lunar month of 1855. He could not rebuild it and had to give back the license to the Moritaza's new zamoto Morita Kan'ya XI. he started to work on the opening of a new theater from 1867 but was killed by a burglar the 23rd day of the 9th lunar month of 1868 . 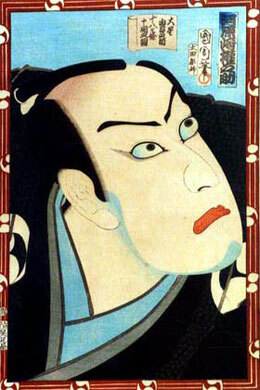 The actor Ichikawa Danjûrô IX held the name of Kawarasaki Gonnosuke VII from the 3rd lunar month of 1869 to August 1873. Born in 1861 in Edo in the district of Asakusa Torigoe-chô. Nephew of Kawarasaki Gonnosuke VI's wife, he was adopted by the Kawarasaki clan in 1870 and received the names of Yamazaki Fukujirô and Kawarasaki Fukujirô (from 1872). He took the name of Kawarasaki Gonnosuke VIII in 1874. He took part as a zamoto in the reopening of the Kawarasakiza in July 1874, which celebrated the shûmei of Ichikawa Danjûrô IX. It unfortunately ended in May 1875. Gonnosuke struggled to find some money and finally reopened the theater, under the name of Shinboriza, in the district of Shinbori-chô. The first program was produced in common with the Nakamuraza in October 1875 and included the famous dance-drama "Kanjinchô", which starred Ichikawa Danjûrô IX (Benkei), Ichikawa Sadanji I (Togashi) and Iwai Hanshirô VIII (Yoshitsune). The Shinboriza went bankrupt the following year, in 1876 and Gonnosuke sold both his license for Kabuki performances and the theater to an investor named Haga Shûhei, who was not belonging to the Kabuki world. This sale definitively sealed the fate of the Kawarasakiza. Afterwards, Gonnosuke joined the management of the Shôchiku as an adviser at the Kabukiza. He died the 9 November 1917. 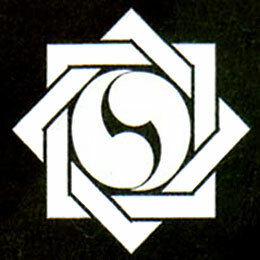 He was the father of the Zenshinza star Kawarasaki Chôjûrô IV. The 4th day of the 8th lunar month of the 3rd year of the Genbun era was the 17th of September 1738 in the western calendar. 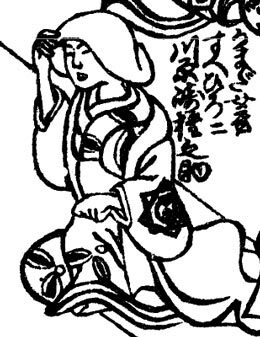 In Nojima Jusaburô's book "Kabuki Jinmei Jiten", Kawarasaki Gonnosuke III was not named Kawarasaki Chôjûrô I in his prime. 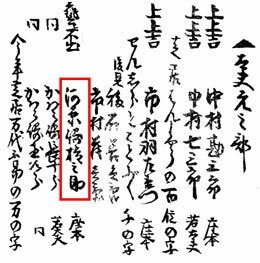 Meanwhile, Kawarasaki Gonnosuke IV was successively named Kawarasaki Chôjûrô I, Kawarasaki Kuniji II and Kawarasaki Gonjûrô before taking the name of Kawarasaki Gonnosuke IV. The 24th day of the 1st lunar month of the 4th year of the An'ei era was the 23rd of February 1775 in the western calendar. The 4th day of the 1st lunar month of the 8th year of the Kansei era was the 12th of February 1796 in the western calendar. The 23rd day of the 9th lunar month of the 1st year of the Meiji era was the 7th of November 1868 in the western calendar.